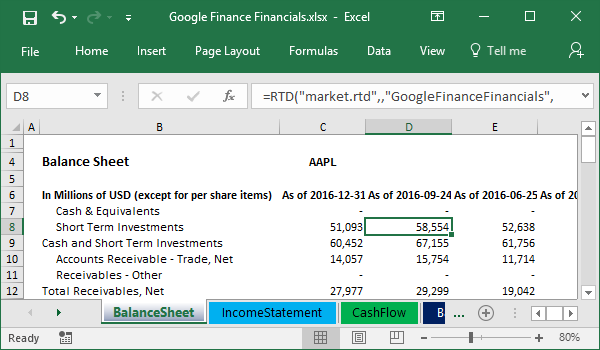 MARKET.RTD allows loading data from Yahoo Finance and MSN Money into Microsoft Excel spreadsheets. Also, you may find models for different data providers in the Examples folder of the downloaded package. 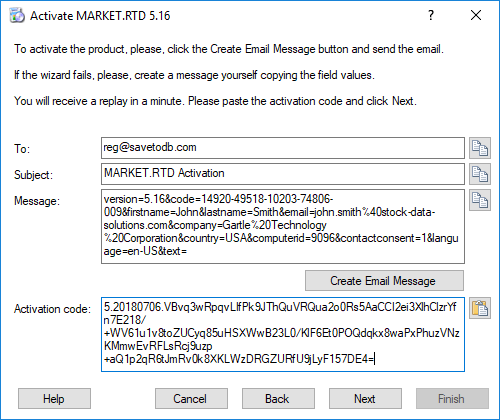 MARKET.RTD is an easy-to-use product. Active your trial after setup. Then open examples from the downloaded package to see the common picture. Then try Formula Builder and create your models. When your trial period ends, choose an edition. Also, read Using MARKET.RTD to understand the product features deeply. 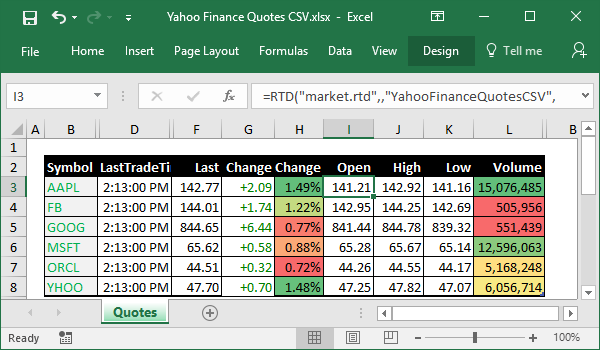 Added fields of earnings and dividends in the YahooFinanceQuotes and YahooFinanceSummary providers. The free MARKET.RTD edition is no longer available. Fixed bugs with codes like BRK-B, BRK-B180720C00195000, and 126.1.BRK/B.NYS. 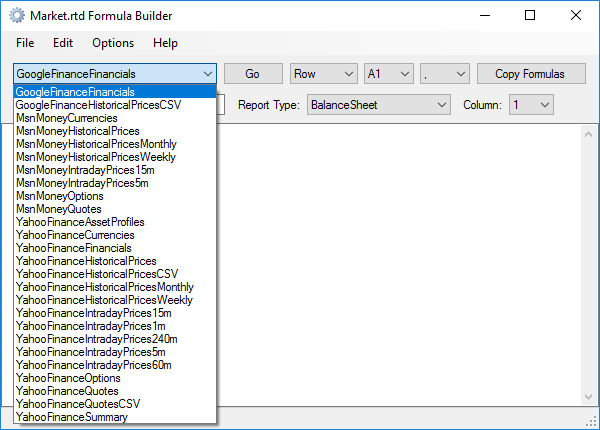 Try the CryptoCurrencies.xlsx example first and Formula Builder then to get formulas for all available topics. GoogleFinanceHistoricalPricesCSV loads historical prices starting January 1, 2013. You may change the start date in the market.rtd.dll.config file. Fixed issues with empty tickers and tickers with trailing spaces. Fixed issues with loading options from Yahoo Finance. Fixed issues with loading options from MSN Money. Fixed issues with loading data from Google Finance. Yahoo Finance blocked several APIs on November 1, 2017. The YahooFinanceQuotesCSV provider does not work now. Use YahooFinanceQuotes instead. The YahooFinanceCurrencies uses an alternative Yahoo Finance data source now and loads data by separate requests. Updated examples to address issues with Yahoo Finance and Google Finance changes. The Google Finance Financials provider uses an updated URL. The YahooFinanceCurrencies provider uses an alternative Yahoo Finance data source. YahooFinanceHistoricalPrices loads prices for five years. Removed YahooFinanceHistoricalPricesCSV provider disabled by Yahoo Finance. Use YahooFinanceHistoricalPrices, GoogleFinanceHistoricalPricesCSV, or MsnMoneyHistoricalPrices instead. 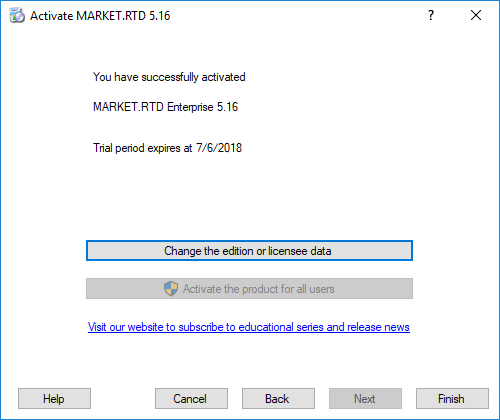 MARKET.RTD 5.0 is a major upgrade of RealTimeToExcel. The new name reflects the main application role, loading market data using RTD formulas. Marker.rtd has a new name of the RTD server: market.rtd instead of gartle.rtd. You may continue use RealTimeToExcel. Existing users may install MARKET.RTD as a new product, test it and purchase the upgrade. See upgrade notes. We redesign the application, data providers, and the documentation. We have tried to make the product as simple as possible to make the learning curve much shorter. MARKET.RTD has a new free edition that allows getting data for 10 tickers. Paid editions have a new simplified model of limits. The Personal and Standard editions have increased limits of updated tickers. Registration is required to start a trial. MARKET.RTD is available as a subscription. We understand that this change breaks existing models. However, existing users may use MARKET.RTD and RealTimeToExcel together and upgrade the models without service interruption. We removed these providers as they have issues and just waste your times. We removed the HTML and database providers from the MARKET.RTD product to make it simple. You may try our new products, WEB.RTD and DB.RTD, that have similar, but significantly improved, features and also are simple. Open Start Menu, All Programs, MARKET.RTD, Register Product to activate a trial. To uninstall MARKET.RTD, open Control Panel, Programs and Features, then select MARKET.RTD and click the Uninstall button. MARKET.RTD is the next major version of RealTimeToExcel. However, MARKET.RTD is a new product. 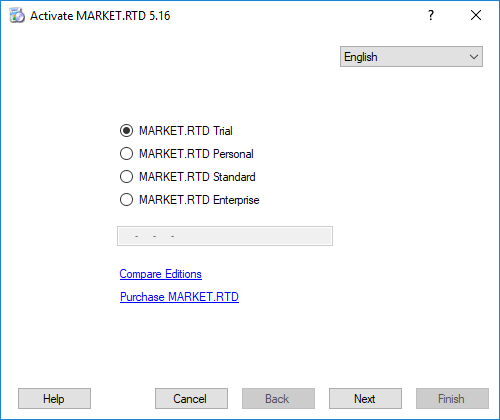 So, you may have both RealTimeToExcel and MARKET.RTD installed and test the upgrade with a minimal service interruption. You may test the upgrade in a trial mode and purchase the upgrade to continue use of MARKET.RTD. MARKET.RTD has a new server name, market.rtd instead of gartle.rtd, and changes in data provider names. See What&apos;s new for details. This End-User License Agreement (EULA) is a legal agreement between you (either an individual or a single entity) and Gartle Technology Corporation for any MARKET.RTD software, use examples and documentation (Software) that accompany this EULA. The commercial use of the MARKET.RTD Personal edition is not permitted, including the use by professional traders and institutional investors. You can use MARKET.RTD without any limit during a 15-day trial period. To purchase a license and register the MARKET.RTD Personal, Standard or Enterprise edition. To purchase a subscription and register the MARKET.RTD Personal, Standard or Enterprise edition. To stop the use and remove MARKET.RTD from a computer. 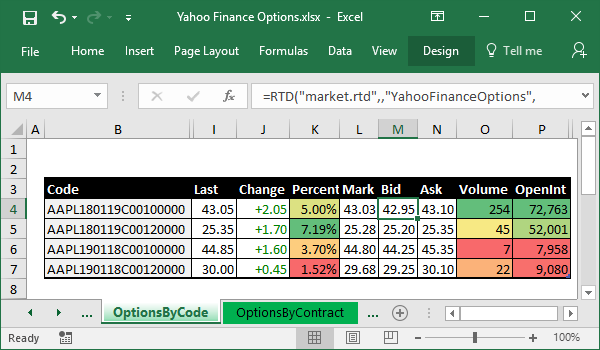 MARKET.RTD allows loading quotes, historical prices, key statistics, financials, option chains for Yahoo Finance and MSN Money. market.rtd is an RTD server name. <provider> is name of a data provider like MsnMoneyQuotes or YahooFinanceOptions. Parameters and data fields depend on data providers. 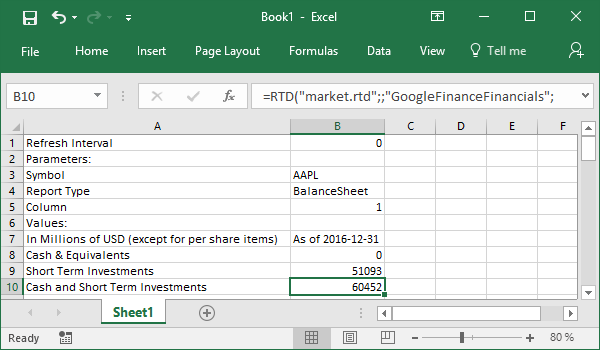 In the next steps, you configure formulas and paste them into Excel spreadsheets. 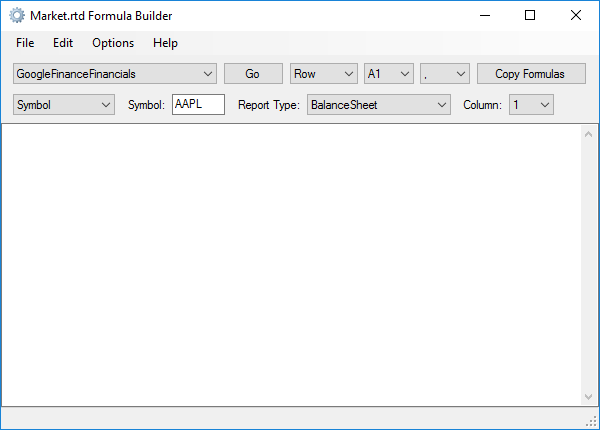 Open Formula Builder using Start, All Programs, MARKET.RTD, Formula Builder. See the Formula Builder description here. Also, you may find formatted reports in the Examples folder of the downloaded package. You may find examples in the Examples folder of the downloaded package. Use these examples as templates or to troubleshoot formulas and loading data. You may use special tick fields. Just add the :tick suffix to the data field name. You may use special data fields to monitor downloading data. The formulas above show the last data update time and the last error code for the AAPL ticker. See a complete list of the special data cells here. You may change some of the application settings. You may open the file using Start Menu, All Programs, MARKET.RTD, Configuration File. 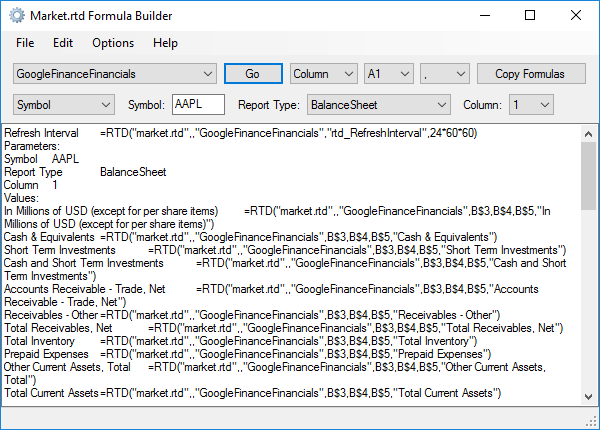 MARKET.RTD Formula Builder builds RTD formulas for the specified provider. You may start it using Start, All Programs, MARKET.RTD, Formula Builder. You may customize the formula layout (Row, Column, or Absolute), formula style (A1 or RC) and the formula separator (comma or semicolon). Then click Copy Formulas, create a new worksheet and paste formulas at cell A1. Then you may format a worksheet as you need or copy formulas to your reports. Note about formula parameters. In the example above, formulas use parameter values from cells B3-B5. So, you may copy columns and change stock tickers or reports columns. You may find this and other ready-to-use forms in the Examples folder of the downloaded package. 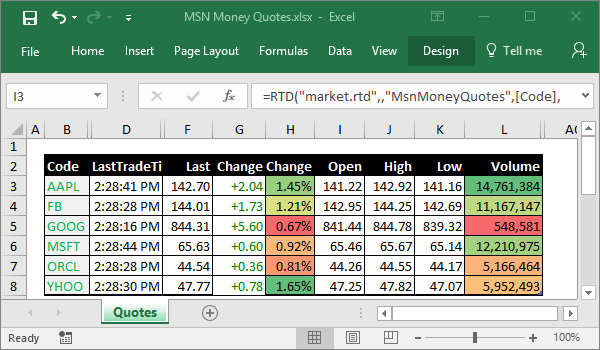 MARKET.RTD loads data from Yahoo Finance and MSN Money. You may test any provider using Formula Builder. Use tickers that you use on the provider website. MARKET.RTD default settings comply with Yahoo! Terms of Services. 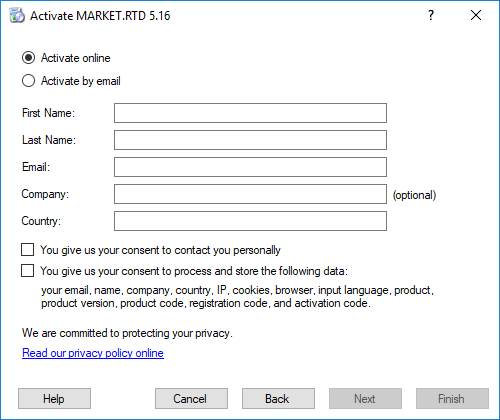 MARKET.RTD loads data from the MSN Money website using undocumented features. This string value allows changing the cache directory of downloaded data. and %USERPROFILE%\Local Settings\Application Data\market.rtd\DataCache on Windows XP. The string value is used to adjust the PC time used in the rtd_LastUpdate, rtd_LastUpdateDate, and rtd_LastUpdateTime fields. The default value is Eastern Standard Time. This string values used to specify Yahoo! API Consumer Key. See below. This string values used to specify Yahoo! API Consumer Secret. See below. You may get application settings using RTD formulas. 1000 calls per hour for IP authenticated users. 10000 calls per hour for applications identified by Access Key. Get your Yahoo! API Key at https://developer.yahoo.com/apps/. Specify Consumer Key and Consumer Secret in the configuration file. #N/A means that the data is "Not available." 1. An error server in the formula. Check the correct value: "market.rtd". 2. An error in arguments. Check the provider, symbol, and the data field. 3. A bad ticker. Check the ticker at https://finance.yahoo.com/. 4. Data absent in a data source. For example, Open, DaysHigh, and DaysLow can be not available during non-trading hours. Add formulas to monitor data status: rtd_LastUpdate, rtd_LastError, rtd_RefreshInterval. See the description in Application Fields. MARKET.RTD requires registration to start a trial and to use it after the trial period. To register, open Start Menu, All Programs, MARKET.RTD, Register Product. To register the MARKET.RTD Personal, Standard, or Enterprise edition, fill-in the product code received after purchasing. 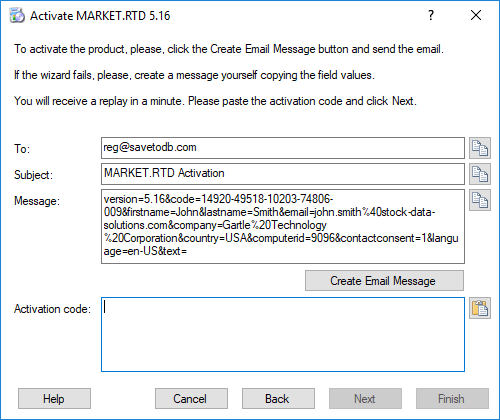 After clicking the Next button, the MARKET.RTD connects to the registration server.